You must have a minimum of 2 batteries. Your batteries must add up to more than 3000 MAh worth of power. Your batteries must be fully charged prior to arriving at the event. Of course, your batteries should have the same connectors as your rifle, and if your rifle happens to be upgraded, should be powerful enough to cycle your rifle. 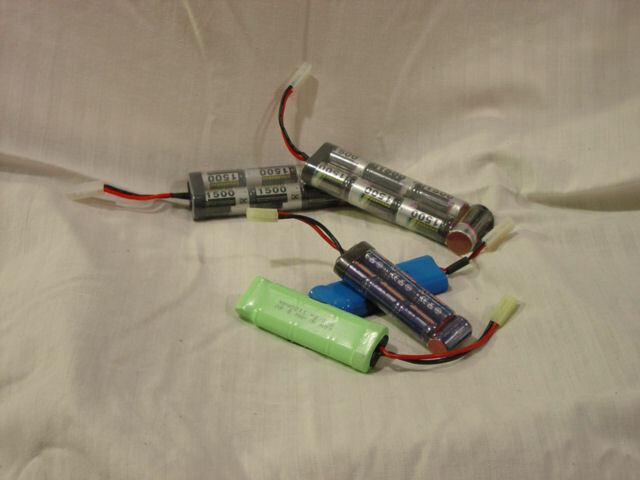 You may want to consider a nondescript, small, durable container for sensitive batteries such as Lithium Polymer (LiPo) and similar batteries. The ability to re-charge your batteries at the event is limited! Plan and prepare beforehand to go without these amenities for 9 days. If you are using a GBBR, this of course does not apply to you. Bring enough of whatever you need to ensure your weapon and magazines work for the duration of the event, in weather and temperature conditions spanning all 4 seasons. This page was last modified on 28 February 2014, at 18:28.